Will robots be able to avoid the heat death of the Universe? 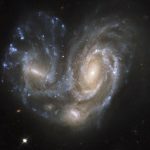 Can galaxies orbit each other like binary stars? And what are the dangers of space radiation to astronauts on the Moon? Could we transfer our consciousness to robots so the human race could survive the destruction of the galaxy and the heat death of the universe? If galaxies are near to each other, will they orbit each other or collide? Ep. 26: Largest Structures in the Universe discusses colliding galaxies. If solar radiation is a problem on Mars, isn’t it a bigger problem on the Moon? If I were located on one of the most distant galaxies from Earth, one that is only exceeded by the Cosmic Microwave Background, what would the sky look like? Why didn’t you mention Herschel in Ep. #132? I see pictures of stars with bowshocks around them. Does our sun have one? I’d like to pursue a career in science journalism — suggestions? Would geostationary satellites work on other planets? The Universe is expanding at an ever greater rate, so doesn’t this constitute adding energy to the Universe? If the redshifting of light indicates all matter is moving away from us, how do galaxies and superclusters collide? What about mechanical energy? For robots. Like an alternator from a car. Or is that breaking the laws of thermodynamics? Sry for spelling am on iPod.